I almost feel like a hypocrite changing all my ways and then feeding everyone else the same blech stuff that I am avoiding! But all of that to say, I just didn’t eat any of it. I had grapes, peanuts, a banana, and a glass of tea. I was fine. Which is just so weird and yet cool at the same time to be able to say. I mean, last year for his one-year birthday party we got the same cupcakes from Sam’s only they had Elmo “rings” on them as toppers instead of Cars 2 toppers like they had this year. And last year over a span of a few days, I ate… ohhhhh, I dunno… about a dozen of them that were left over. About a month before had been my sister-in-law’s wedding shower and guess what we had there? Oh, yes… cupcakes. And I think that I had eaten about a dozen of them as well. And take a wild guess as to what we had at my older son’s birthday party just a few months later? Oh my gosh… you’re good. 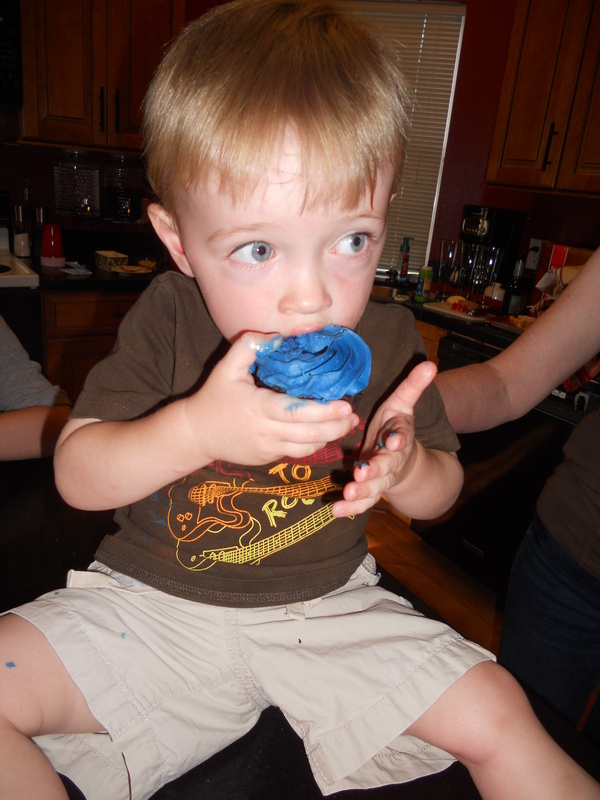 So that’s why I say it is weird to think that for this cupcake birthday, I ate… none… of the birthday food. And what’s even weirder and even cooler is that it wasn’t difficult for me. There was no battle inside. There was not a sneaking into the bathroom to shove a cupcake down my throat. There was just… a birthday. A celebration of my son’s life. And silently… all by myself… hidden away in a party room in my soul… I had another celebration. A celebration of my new life. My new life of freedom. I love this. I have found many times 1 is too many and a thousand is not enough. Often no cupcakes are easier than one or two or just one more maybe three. Thanks again for sharing your journey. We are not alone! “Often no cupcakes are easier than one or two or just one more maybe three.” You nailed it. I keep, keep, keep coming across that realization. And each time I think… oh man, I just want to be free of this forever. I would not be surprised if I keep a lot of this covenant stuff going after “the deadline” just because I crave this freedom more than I crave chocolate. At least… I think. Haha!